A structured, clear and geometrical exterior counterbalances a flexible, moveable interior: the NOHrD Hedge Hock creates a harmony of dynamic and static equilibrium. Your body will shape its own mold in the wooden block surface, enabling a true ergonomic sitting position. It defies logic to think that natural wood can be comfortable, the NOHrD Hedge Hock is, however, a unique sitting experience! 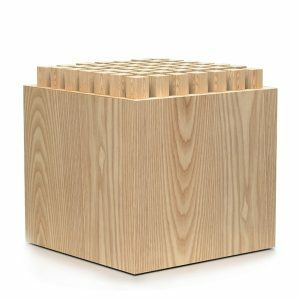 The 49 solid wood blocks are individually spring suspended within the outer wood cube.